Just in case I forget one day: if you want to get rid of that annoying guessgame Eclipse 3.5 does when hitting F11 you have to change the "Launch Operations" option in Window->Preferences->Run/Debug->Launching to "Always launch the previously launched application". Afterwards the F11 will do what I always want it do. Admittably the Ctrl+Alt+X shortcuts are unwieldy, but they are good enough to launch something specific in the rare cases I want that. I just finished setting up a configuration where a separate Maven project is used to run some JWebUnit tests on a web application. The focus is on regularly checking the application functionality, so we don't care about running on the production stack (yet), we rather want an easy to run and quick test suite. We assume that the application we want to run defaults to some standalone setup, e.g. by using something like an in-memory instance of hsqldb as persistence solution. It also has to be available via Maven, in the simple case by running a "mvn install" locally, the nicer solution involves running your own repository (e.g. using Artifactory). This configuration can be run with "mvn integration-test". Note that in this case we depend on a SNAPSHOT release of our own app. This means that you can nicely run this test in your continuous integration server, triggered by the successful build of your main application (as well as any change in the tests itself). If you use my favorite CI server Hudson, then you can even tell it to aggregate the test results onto the main project. Having a POM like this you can launch straight into the JWebUnit Quickstart. A basic setup needs only the POM and one test case in src/test/java. Of course you can use a different testing framework if you want to. You can also switch the Servlet engine or deploy into a running one. The Cargo documentation is pretty decent, so I recommend looking at that. They certainly know more Servlet engines than I do. If you use profiles to tweak Cargo in the right way, you should be able to run the same test suite against a proper test system using the same stack as your production environment. I haven't gone there yet, but I intend to. The setup used here is really intended for regular tests after each commit. By triggering them automatically on the build server the delay doesn't burden the developers, but they are still fast enough to give you confidence in what you are doing. will replace the space after the word "word" with a line break across the whole file. Sometimes it is useful to have Maven use some JARs that are checked in with the project, e.g. since you don't trust anything else or you just can't find a library in an existing repository and don't want to run your own. What you need for this is a folder structure representing those three bits of information: groupId, artifactId and version (in that order), i.e. lib/owlapi/owlapi/2.2.0. In that folder Maven expects at least four things: the JAR file, a matching POM file and the SHA1 sums for both. All files are named using the artifactId and the version, i.e. 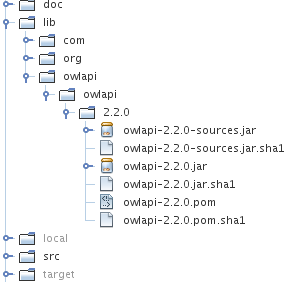 "owlapi-2.2.0.jar" for the JAR, the same for the POM but with the different extension. That's all there is -- next time you run Maven it should "download" the files from that location. Considering that the POM also provides a uniform way of storing licence, source and version information it is actually a quite useful approach for storing dependencies inside your project's space.